The news is filled with horror stories surrounding dogs and their dangerous and sometimes fatal bites. While few of us have any sympathy for the crooks and criminals attacked by dogs protecting their owners, we do feel sympathetic for those attacked by dogs in a vicious manner for no reason other than they were simply in the wrong place at the wrong time. We often hear in the news stories about dogs biting kids and owners in the greater Bingahmton, NY area due to negligent owners. According to statistical research conducted by the American Society for the Prevention of Cruelty to Animals, there are approximately 80 million pet dogs in the USA alone. The beautiful creatures that are known to be best friend to man, protector of the family and the home, and sweet companions for children are not always so. Dogs are gentle and kind, but there are some dogs that have been raised to behave aggressively. As many as 4.5 million people are attacked by dogs on an annual basis, many children included. It does have a lot to do with how a dog is raised and the environment in which he or she is raised, but there is never any telling when a dog might react in a manner that is dangerous. If you or someone you loved has been the victim of a dog bite or attack, Tom Schimmerling and his legal team can help. With years of experience working closely with the victims of dog attacks, Mr. Schimmerling and his team know the ins and outs of the process, and precisely how to ensure your family no longer has to suffer at the hands of a dog not raised as man’s best friend. Not all dogs are dangerous; in fact, even dogs that grace the list of most dangerous breeds in the world are not all dangerous. It is very important to understand that dogs react differently in different situations. If a child hits a dog, that dog is likely to bite that child no matter if it is one of the most dangerous dogs in the world or if it is small dog not considered dangerous. Additionally, dogs raise din homes in which they are abused, where they are taught to be aggressive and not taught proper behavior are also more dangerous. You will note that some of the dogs on this list are not dogs you might expect to be dangerous. Great Danes and St. Bernards, for instance, are very friendly dogs when they are raised correctly. Both think they are much smaller lap dogs, but their size is more dangerous than anything. German Shepherds are among the most intelligent dogs in the world and often used for police work, but they are fiercely protective and very loyal. This makes them dangerous to those who cross them or their family without warning. Small dogs are noticeably absent from this list, and that’s a mistake. Some dog owners feel that a small dog is not a danger to anyone because of its size and they fail to take the proper precaution to ensure their dog is not dangerous. Small dogs are just as dangerous, but they are often easier to fight off and they are not so large. However, they can cause just as much bodily harm in an attack. Dogs treated harshly are more likely to bite – Dogs that are raised in harsh conditions are more likely to bite. This does not mean that every single dog raised by neglectful humans or in a dog fighting ring is aggressive. It simply means that they are taught aggression and are more likely to bite a person than a dog raised with love and good manners. Babies are very dangerous to dogs – Dogs are, as a whole, very loving and affectionate creatures. However, babies are quite dangerous to dogs and should never be left alone with any dog – even a small one. Babies are not gentle, and do not grasp that concept. They are likely to crawl on dogs, grab them, scare them and hit them in the face, causing the dog to immediately want to protect itself. This is one of the most common causes of infant and child dog bites. Dog bites can happen anytime, anywhere. There is no way to know which dog will bite, which will not and what might set a dog off. However, the CDC does have a list of common dog bites and statistics related to that. Familiarizing yourself with this information can protect you from dogs that might big. Unfortunately, while so many people are confident in their dog’s love for their children, children are the most likely victims of dog attacks. It’s not to say that all dogs are vicious or would ever attack a child. However, children are not known for their gentle behavior and their calm nature. Sometimes children can scare even the calmest dogs, making them feel as if they are nervous, scared or in danger and a bite is the most common way that they defend themselves. It’s always a good idea to ensure your children are as safe as possible around pets and this is done in several different manners. When children are aware of how to behave around dogs, they are far safer. Even the most docile, calmest dog can become fearful and scared and react poorly to a child if that child scares him or her; you do not want that for your children. As stated above, there is no way to know when a dog might attack. There are ways to educate yourself and your children to avoid a potential dog attack, but there is no way to ensure that a dog will or will not attack you. If you find yourself in a situation in which a dog attacks you or a loved one, there are things you must to do ensure your safety and health. The simple fact of the matter is that you never know if a dog might have a disease or an illness, such as rabies that needs to be treated immediately. If a dog attacks, it could be because you scared it or because it is aggressive. However, it might also have rabies and it is imperative that no matter how minor your injuries, you seek medical attention immediately to care for your dog bites. Dogs are man’s best friend, but no one is perfect. Dogs attack and it happens to people all the time, and the damage is often more than just a newfound fear of animals. Anyone attacked by a dog has a chance of suffering far more than lacerations and bites. In most instances, dogs attack because they are the product of a neglectful owner who does not effectively teach and educate their animal, restrain it or keep it from harming others. 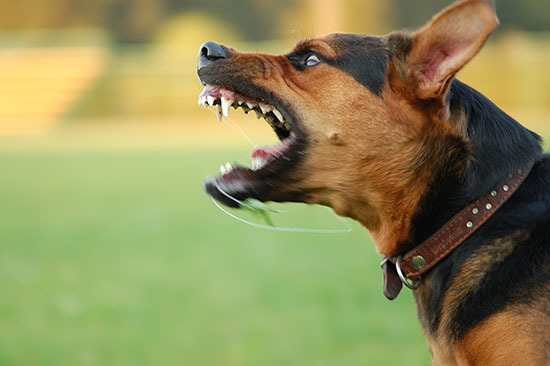 When a dog owner in the Binghamton area is not in control of their animal’s behavior, it become their responsibility to handle the damages that are done to another person when a dog attacks. Tom Schimmerling and his team of legal advisors can help your family hold neglectful and owners legally accountable for their dog’s actions. Call today to schedule a consultation to begin the process of healing after a traumatic dog attack.